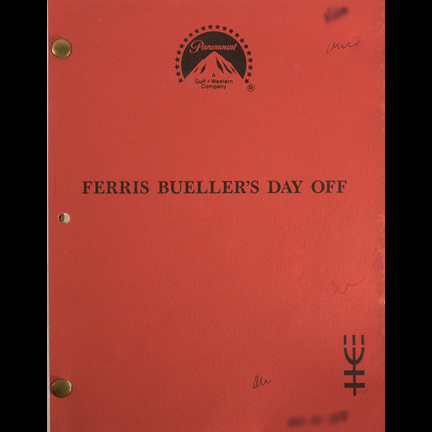 This script is a draft of the classic 1986 motion picture, "Ferris Bueller’s Day Off," directed by John Hughes. Located on the cover of the script is the Paramount logo, film title, and graphic symbol printed in black ink. The property master’s last name is written in the upper right corner, a string of numbers written at the lower right, with two randomly placed scribbles. 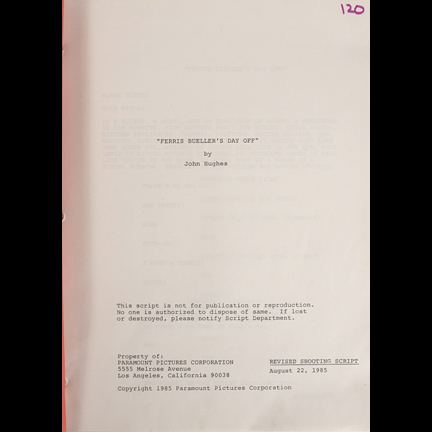 The cover page information identifies this as a revised shooting script dated August 22, 1985. 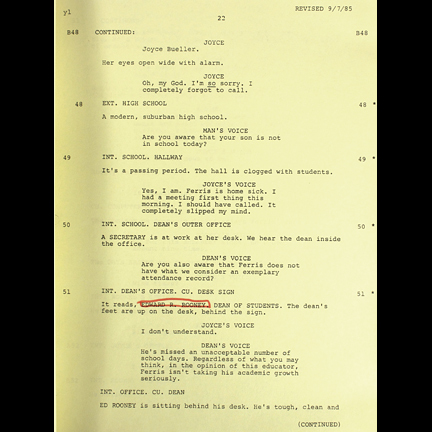 Additional revisions are indicated by the inclusion of different colored pages of revised changes. 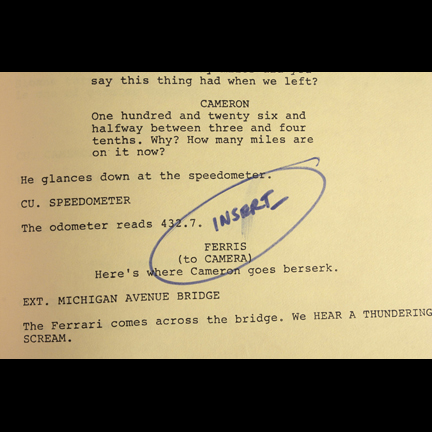 The script includes numerous notations that give fascinating insight into the making of the film, such as references to branded products like "Pepsi," specific denominations of currency needed, and exact odometer readings to be used for certain scenes involving the Ferrari. 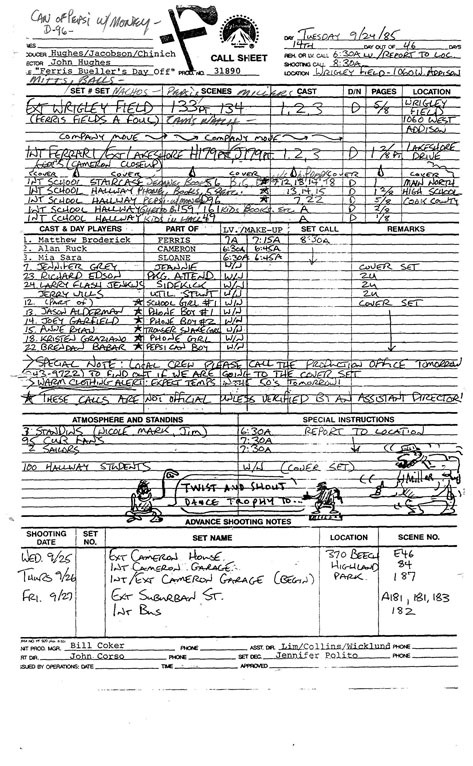 Also includes Xerox copies of the original call sheets listing assorted production notes with several humorous cartoon drawings referencing the filming of the "Twist and Shout" parade sequence. 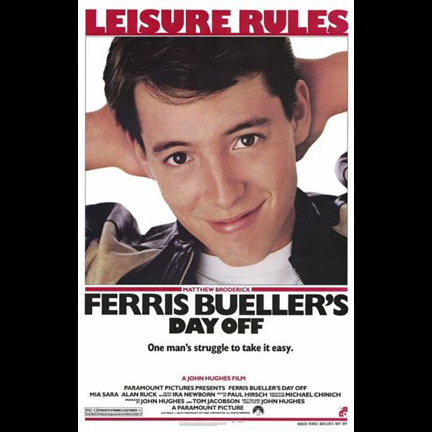 "Ferris Bueller’s Day Off" is one of the most iconic films produced in the 1980’s and remains one of director John Hughes’ most beloved films to date. 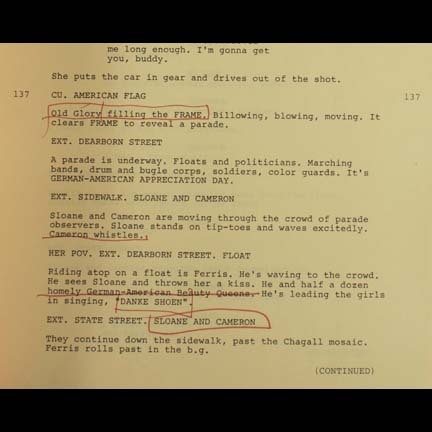 Mr. Hughes wrote the original screenplay and also co-produced the film. 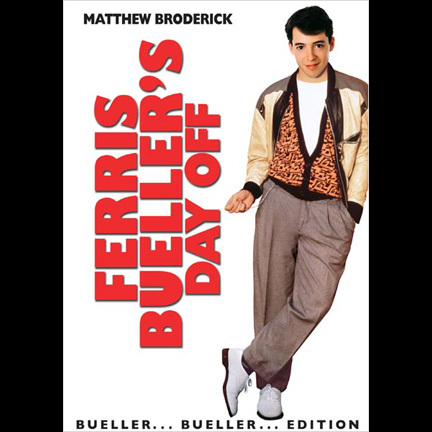 Actor Matthew Broderick received a 1987 Golden Globe nomination for Best Performance by an Actor in a Motion Picture – Comedy / Musical for his work on the film. 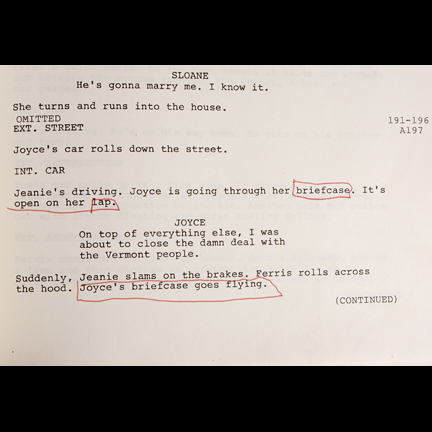 The script is in good condition with some minor evidence of age and wear that occurred during its extensive use on various sets and locations. Accompanied by a letter of authenticity from the film’s assistant property master who retained the item after the production had been completed. Presented by The Golden Closet, your premier source for iconic screen used wardrobe, props, and music entertainment memorabilia.